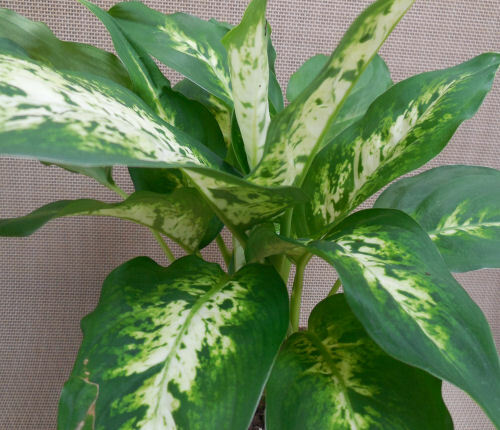 Dieffenbachia is one of those stately looking indoor plants with very large leaves that are variegated. It is fairly easy to grow, and makes a great addition to your collection of indoor plants. Most people grow Dieffenbachia for their eye catching leaves. The plant gives a tropical look and various varieties can be striped, spotted or have colored veins. Some are solid colors. All are impressive. Be sure you have room for it. Dieffenbachia can grow quite tall. They will lose their bottom leaves in time. This gives them a palm tree like shape which is quite attractive. They may need staking if they get too tall, or they will get top heavy. The plant will grow in a wide range of light conditions, but likes bright, indirect light the best. This makes it an ideal houseplant. You will know if it gets too much light because the leaves will start to yellow. If you have it in very low light, it will grow but only very slowly. Water when the soil is starting to get dry. Just stick your finger in to the first knuckle. If the leaves droop, or start to brown on the edges, this is a sign that it needs more water. Fertilize with a houseplant fertilizer in spring and early summer. Do not fertilize in the winter. The plant loves humidity. Putting it in a bathroom will give you bath a great look and give it the humidity it likes. If you can’t do this, mist the leaves from time to time. The plant will grow easily from cuttings in a glass of water. Plant in potting soil when the roots have started to grow. Keep the temperature above 50 degrees. Ideal is 65 to 75 degrees. A spot outside in the shade during the summer will be fine as long as it does not get too hot where you live. The plant will grow from stem cuttings. When your stem has dropped a lot of leaves, cut a piece of the stem off, and slice int 2″ pieces. Dry them for a day or so and then stick into a rooting medium such as perlite, sand or vermiculite. The cuttings will establish roots and then grow into new plants. 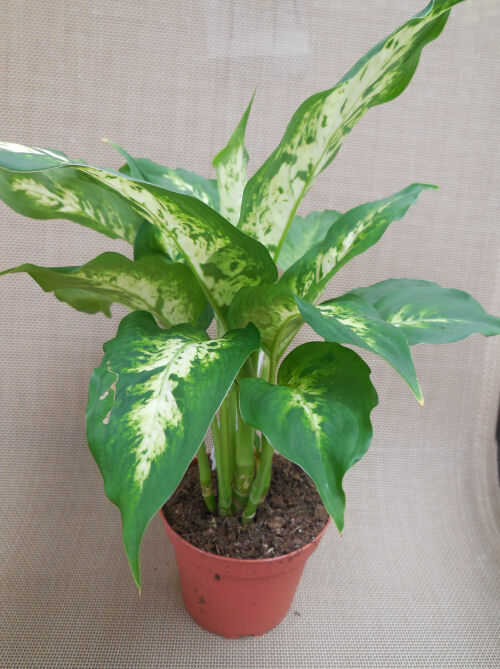 The common name for Dieffenbachia is dumbcane. This comes from the fact that all of the plant’s parts contain raphides (crystalline, needle like structures which cause stinging and burning of the mouth and throat.) Handle the plant with care when making cuttings and keep small children and pets away from the plant. 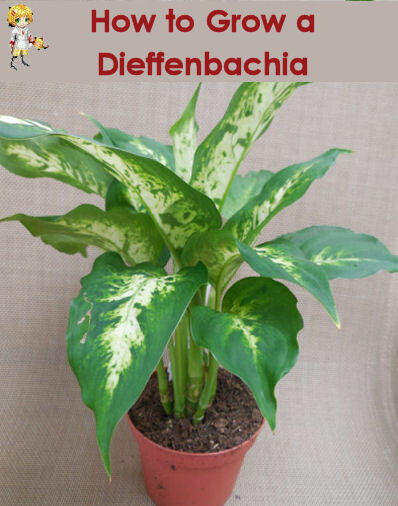 Check out this article for more information on Dieffenbachia poisoning. I was hoping for some help in determining what the powdery white substance is on the leaves of my dieffenbachia maculata. I first notice it about 3 weeks ago. I washed the plant; the powdery substance was gone. Now it back. HELP! Hi Berta. It sounds as though you might have a case of powdery mildew. It is a fungal infection and will spread to other plants. Most home improvement stores carry fungicides that will take care of it. Thank you sooooo much for this information. I was at a complete loss as to how to care for my plant. I’m going to try to add a picture of it. A friend recommended I put it in a glass of water but would lovea 2nd opinion.